Background Previous studies suggested that diverse cells in cancer microenvironment can interact with CD8+ T cells via exosomes. We designed this study to explore the potential interaction between exhausted CD8+ T cells and normal CD8+ T cells via exosome. Methods Fluorescence activated cell sorting was used to get PD1+TIM3+/PD1−TIM3−CD8+ T cells. Exosomes from the cell culture medium were collected by ultracentrifugation. Microarrays were performed to analyse the lncRNA expression profile in exosomes. Results Functional exhausted CD8+ T cells could secrete vast exosomes, which can be uptake by normal CD8+ T cells, and impaired their proliferation (Ki67), cell activity (CD69) and the production of cytokines such as interferon-γ and interleukin-2. Microarray detection identified 257 candidate lncRNAs differently expressed in exosomes derived from exhausted CD8+ T cells and non-exhausted CD8+ T cells. Functional enrichment analysis indicated that these lncRNAs actively participated in the regulation of diverse process of CD8+ T cell activity, like metabolism, gene expression, biosynthetic process and so forth. Conclusions The exosomes derived from exhausted CD8+ T cells could be uptake by non-exhausted CD8+ T cells and subsequently impaired the function of receipt cells. Exosomes secreted from exhausted CD8+ T cells have distinct lncRNA expression profiles which are significantly different from those in exosomes secreted by non-exhausted CD8+ T cells. CD8+ T cells are the major anticancer effector cells in cancer microenvironment.1 However, on the persistently chronic stimulation of tumour antigen, CD8+ T cells are generally in dysfunctional states characterised by reduced proliferation and activation, and impaired anticancer effect, termed T cell exhaustion.2 3 Exhausted CD8+ T cells produce low level of effector cytokines (interferon-γ (IFN-γ), interleukin-2 (IL-2) and tumour necrosis factor-α) and show compromised cytotoxic ability.2 4 Previous studies suggested that diverse cells in cancer microenvironment can interact with CD8+ T cells by direct contact or some indirect means, for example, via exosomes.5 6 Exosomes (30–150 nm) are vesicles derived from multiple types of cells and participate in intercellular communication by transmitting intracellular cargoes, such as proteins and nucleic acids, or through the receptors on the surface.7 8 In cancer microenvironment, exosomes secreted from cancer cells or immune cells could be uptake by tumour-infiltrating CD8+ T cells, and regulate the function and antitumour effect of CD8+ T cells.6 9 In this study, we found that functional exhausted CD8+ T cells could secrete vast exosomes, which can be uptake by normal CD8+ T cells, and impaired their antitumour efficiency. Exosomes are rich in variety of RNAs, such as mRNA, miRNAs and long non-coding RNAs (lncRNAs). LncRNAs have been well established as important regulator of the differentiation and function of T cells.10 So we want to explore the distinct lncRNA expression profile in exosomes derived from exhausted CD8+ T cells, which may help us to understand the underlying interaction of CD8+ T cells in different states and throw light on the study of dysfunctional anticancer immunity. 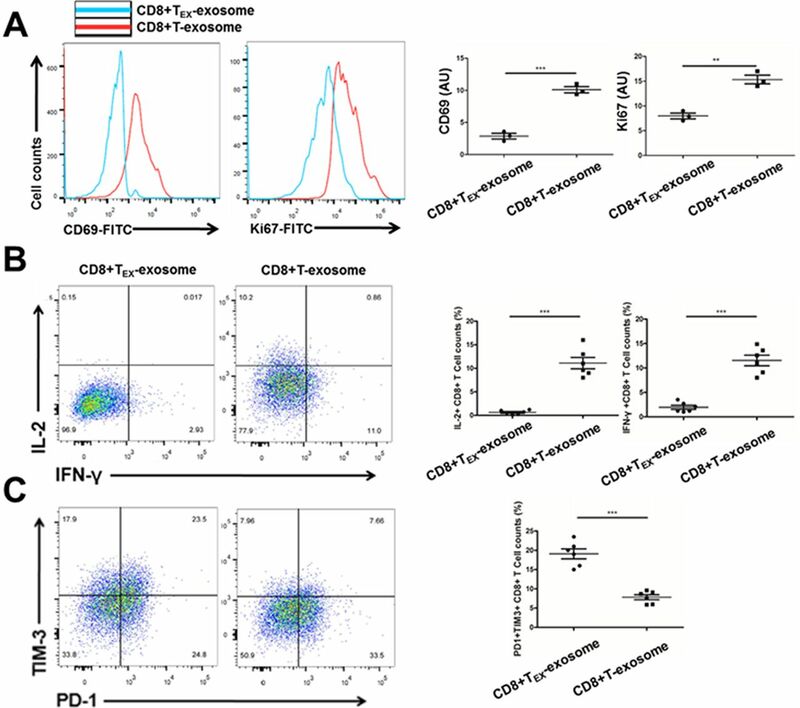 Flow analysis showed that CD8+ T cells separated from HCC tissues expressed different levels of inhibitory receptors, programmed cell death 1 (PD1) and T cell immunoglobulin and mucin domain-containing protein 3 (TIM3). Accordingly, tumour-infiltrating CD8+ T cells were divided into exhausted group (PD1+TIM3+) and non-exhausted group (PD1−TIM3−) (online supplementary figure 1A). Exhausted CD8+ T cells and non-exhausted CD8+ T cells were collected by fluorescence activated cell sorting and cultured in vitro, then exosomes in the medium were isolated and identified (online supplementary figure 1B,C). Exosomes derived from exhausted CD8+ T cells (CD8+TEX-exosome) were added to the culture supernatant of non-exhausted CD8+ T cells. As shown in figure 1, CD8+ T cells cocultured with CD8+TEX-exosome presented decreased proliferation (Ki67) and cell activity (CD69) (figure 1A), and reduced production of cytokines such as IFN-γ and IL-2 (figure 1B). Moreover, after cocultivation with CD8 +TEX-exosome, CD8+ T cells showed higher percentage of exhausted T cells (PD1+TIM3+) (figure 1C). These indicated that exosomes derived from exhausted CD8+ T cells could promote the exhaustion of non-exhausted CD8+ T cells. CD8+ T cells cocultured with CD8+TEX-exosome presented impaired function. (A) CD8+ T cells cocultured with CD8+TEX-exosome showed decreased proliferation (Ki67) and cell activity (CD69). (B) CD8+ T cells cocultured with CD8+TEX-exosome showed reduced production of cytokines such as interferon-γ (IFN-γ) and interleukin-2 (IL-2). (C) CD8+ T cells cocultured with CD8+TEX-exosome showed higher percentage of exhausted T cells (PD1+TIM3+). CD8+TEX-exosome, exosomes derived from exhausted CD8+ T cells; CD8+T-exosome, exosomes derived from non-exhausted CD8+ T cells. It was previously reported that exosomes may function through the ligand on the surface to interact with the distinct receptor of CD8+ T cells, or act as cargoes to transport the containing active component. Formerly, we have reported that CD8+ T cells can uptake exosomes secreted from liver cancer cells in the cancer microenvironment. Here, we perform the immunofluorescence assay with the CD8+ T cells cocultured with prestained exosomes. As we can see, non-exhausted CD8+ T cells could uptake exosomes derived from exhausted CD8+ T cells (figure 2A). This suggested that exhausted CD8+ T cells could impair the function of non-exhausted CD8+ T cells at least partly through exosomes, which were secreted from the former and uptake by the later. Exosomes derived from exhausted CD8+ T cells uptake by non-exhausted CD8+ T cells; top 10 candidate exhaustion-associated exosome lncRNAs. (A) Non-exhausted CD8+ T cells could uptake exosomes derived from exhausted CD8+ T cells. (B) Microarray detected the difference of lncRNA expression profile in exosomes derived from exhausted CD8+ T cells and non-exhausted CD8+ T cells, and the top 10 candidate lncRNAs were shown here. 0.1×, 1×, 5×, exomes isolated from supernatant from 0.1, 1, 5 million exhausted CD8+ T cells were cocultured with 1 million CD8+ T cells. Exosomes usually contain diverse functional RNAs, like mRNAs, miRNAs, circular RNAs and lncRNAs, which could regulate the activity of recipient cells on transcriptional or post-transcriptional levels. In our previous studies, we have reported the pivotal roles of lncRNAs in regulating the differentiation and function of T cells. So here, we want to explore the distinct lncRNA expression profile in exosomes derived from exhausted CD8+ T cells and try to find several potential candidate exosome-associated lncRNAs which were involved in the interaction of CD8+ T cells in different states. Microarray detection was performed to investigate the difference of lncRNA expression profile in exosomes derived from exhausted CD8+ T cells and non-exhausted CD8+ T cells. Totally, 257 candidate lncRNAs were identified (online supplementary figure 2). Additionally, Gene Ontology enrichment analysis was used to annotate the molecular function, biological process and cellular component of the candidate lncRNAs, which indicated that these lncRNAs actively participated in the regulation of diverse process of CD8+ T cell activity, like metabolism, gene expression, biosynthetic process, and so forth (online supplementary figure 3). Besides, we showed the top 10 significantly differently expressed lncRNAs in figure 2B, which we plan to further study their function in the development of CD8+ T cell exhaustion. We found that exhausted CD8+ T cells could interact with non-exhausted CD8+ T cells via exosomes. The exosomes derived from exhausted CD8+ T cells could be uptake by non-exhausted CD8+ T cells and subsequently impaired the function of receipt cells. Exosomes secreted from exhausted CD8+ T cells have distinct lncRNA expression profile which are significantly different from those of non-exhausted CD8+ T cells. These may provide potential candidate exosome-associated lncRNAs for us to study the underlying mechanism of the CD8+ T cell exhaustion in cancer. Fresh human hepatocellular carcinoma (HCC) tissues (n=20) were collected from patients who have undergone liver resection. Single-cell suspensions was prepared by using gentleMACS Dissociator according to user manual. CD8+ T cells were isolated from tumour-infiltrating lymphocytes by antihuman CD8 beads. Patients’ characteristics are presented in online supplementary table 1. Positive-sorted T cells through beads were loaded and analysed by flow cytometry, then cell sorting was done (BD ARIA III). CD8+ T cells were activated with anti-CD3/CD28 beads (Thermo Fisher Scientific, MA, USA) at a 1:2 bead-to-cell ratio in addition to 100 U IL-2 in 1 mL culture median. CD8+ T cells ready for CD69 assay were pretreated with phorbol 12-myristate 13-acetate (PMA, 25 ng/mL, Sigma-Aldrich, MA, USA) and ionomycin (1000 ng/mL, Sigma-Aldrich), while CD8+ T cells that were used for IL-2 and IFN-γ assay were pretreated with PMA (50 ng/mL), ionomycin (1000 ng/mL) and Brefeldin A (5000 ng/mL, Sigma-Aldrich). Antibodies used are described in online supplementary table 2. Exosomes in supernatant were obtained from CD8+ T cell culture median for 48–72 hours. Supernatants of cell culture medium were collected and then centrifuged at 800×g for 5 min and followed by centrifugation of 2000×g for 10 min to remove cellular fragments. Then, the medium was filtered through a 0.2 µm pore strainer (Syringe filter), and ultracentrifuged at 100 000×g for 2 hours at 4°C. For the uptake observation of exosomes, isolated exosomes were incubated in 1 µM 1,1′-dioctadecyl-3,3,3′3′-tetramethylindocarbocyanine perchlorate (DiI, Thermo Fisher Scientific) for 20 min, then phosphate buffered saline (PBS) wash was needed following the centrifugation. Exosomes were resuspended by PBS. Cells were cocultured with DiI-labelled exosomes for 2 hours. Then immunofluorescence was performed according to the manual introductions. Total RNAs extracted from exosomes were under reverse transcription to obtain double-stranded cDNAs that were amplified. Samples prepared as required were labelled and hybridised to SBC Human (4*180K) lncRNA microarray (Shanghai Bohao Biotechnology, Shanghai, China). The genes which differentially expressed a >2-fold change of threshold value were selected, as well as Benjamini-Hochberg corrected p values of <0.05. CLUSTER V.3.0 software (Stanford University School of Medicine, Stanford, CA, USA) was used to normalise and hierarchically cluster the data. Tree visualisation of the data was performed with Java TreeView software (Stanford University School of Medicine). Gene product attributes were described with three structured networks of defined terms provided with GO analysis from Gene Ontology (www.geneontology.org). XW, HS and QH contributed equally. Contributors Conception and design: XJL. Provision of study materials or patients: XW, QH and HS. Collection and assembly of data: XJL, WT and HS. Data analysis and interpretation: XW and QH. Manuscript writing: XJL and XW. Manuscript revision: XW, QH, HS and AX. Final approval of manuscript: all authors. Funding This work was supported by the National Natural Science Foundation (Grant No: 81772596 to XJL); and the Postgraduate Education Reform Project of Jiangsu Province (Grant No: JX22013394 to XW). Correction notice This article has been corrected since it was published Online First. Figure 1 has been replaced by the correct version.